Naturalized in the U.S. (GRIN). It is present in North America as an introduced species and invasive weed (GBIF). List B noxious weed in Colorado, secondary noxious weed in Iowa, noxious weed in Missouri, and "B" designated weed quarantine in Oregon (GRIN). Not present in California (Calflora, Jepson eFlora). Based on locations in GBIF, there is overlap with D. laciniatus distribution and California's climate in parts of Europe (Cal-IPC). It is present in North America as an introduced species and invasive weed (GBIF). List B noxious weed in Colorado, secondary noxious weed in Iowa, noxious weed in Missouri, and "B" designated weed quarantine in Oregon (GRIN). Exotic invasive species in the U.S., introduced from Europe, increasing dramatically in abundance over the last several decades (The Effects of Fertilization and Time of Cutting on Regeneration and Seed Production of Dipsacus laciniatus (Dipsacacae)). Dudley, M.P.., Parrish J.A.D.., Post S.L.., Helm C.. G., & Wiedenmann R.N. (2009). The Effects of Fertilization and Time of Cutting on Regeneration and Seed Production of Dipsacus laciniatus (Dipsacacae). Natural Areas Journal. 29, 140–145. It is present in North America as an introduced species and invasive weed (GBIF). List B noxious weed in Colorado, secondary noxious weed in Iowa, noxious weed in Missouri, and "B" designated weed quarantine in Oregon (GRIN). Exotic invasive species in the U.S., introduced from Europe, increasing dramatically in abundance over the last several decades (The Effects of Fertilization and Time of Cutting on Regeneration and Seed Production of Dipsacus laciniatus (Dipsacacae)). Overlaps with California climate zones in Oregon (Cal-IPC). D. fullonum (D. sativus) is invasive in Mexico, Chile (PIER). D. fullonum and D. sativus are listed as moderate weeds by Cal-IPC (California Invasive Plant Council). Overlap with California climate zones (Cal-IPC). Primarily present throughout Europe (including the Mediterranean region) and in the northeast U.S. Native to Europe and Asia (GBIF). Although there is overlap with California's climate zones in parts of Europe, most of the locations in northern Europe and elsewhere in North America do not overlap and the question is marked no (Cal-IPC). It is now a dominant species in some areas, such as a tallgrass prairie in Illinois (GBIF). Threatens populations of native prairie and savanna species in the Midwest. Dominates local flora due to well-developed taproot, secondary chemicals, spiny stems and leaves, extended photosynthetic season, and large rosettes that shade out other species (The Effects of Fertilization and Time of Cutting on Regeneration and Seed Production of Dipsacus laciniatus (Dipsacacae)). Teasel may develop large monocultures, negatively impact riparian area integrity, and occupy habitats important to sensitive or threatened plant species. Cut-leaved teasel is "more aggressive" than common teasel and that cut-leaved teasel has "severely threatened" the "natural quality" of several "high quality" prairies, savannas, seeps, and sedge meadows in northern and central Illinois (EOL). Noted as benefiting from fire due to lack of vulnerability to fire and creation of ideal conditions for germination (The Effects of Fertilization and Time of Cutting on Regeneration and Seed Production of Dipsacus laciniatus (Dipsacacae)). Teasel's preference for moist sites suggests that fires may be infrequent and of low severity in nonnative North American habitats (EOL). An exhaustive Google/Google Scholar search did not reveal any additional evidence of changes to fire regimes or promotion of fire, and the question defaults to a “no” answer at this time. The erect, branching stem is hollow and prickly (GBIF). Mammalian herbivores shun Cut-Leaved Teasel as a food source because the foliage and flowerheads are quite coarse and prickly. In overgrazed pastures where there is little else for cattle to eat, this is one of the few plants that is left standing. Barbs and spines defend teasel against herbivory and may focus grazing or browsing on unprotected associated vegetation (EOL). Marked yes based on the evidence of grazing impacts. While large, dense teasel populations are possible, without periodic disturbances they are likely to be replaced by slow-growing, late-seral species (EOL). An exhaustive Google/Google Scholar search did not reveal any evidence of production of impenetrable thickets and the question defaults to a “no” answer at this time. Teasel reproduces by seed, and plants die after flowering. Plants may sprout following damage during the rosette or flowering stage. Following similar damage or stem removal, survival of cut-leaved teasel may exceed that of common teasel. After cut to ground level, common teasel rosettes over 4 inches (10 cm) in diameter sprouted and regrew about 50% of the time. Cut-leaved teasel may sprout and regenerate after belowground cutting (EOL). However, resprouting in a non-woody species after damage does not justify a "yes" answer, and this defaults to a "no". An exhaustive Google/Google Scholar search did not reveal any evidence of this, it is a terrestrial plant that is unlikely to naturally fragment, and the question defaults to a “no” answer at this time. The plant reproduces only by seed. Bentivegna, D. J., & Smeda R. J. (2011). Cutleaf Teasel (Dipsacus laciniatus): Seed Development and Persistence. Invasive Plant Science and Management. 4, 31–37. The head may contain up to 1500 flowers (GBIF). One flowering event by one plant can produce up to 2660 seeds (The Effects of Fertilization and Time of Cutting on Regeneration and Seed Production of Dipsacus laciniatus (Dipsacacae)). Individual plants can produce between 1,300 to 33,500 seeds (Cutleaf Teasel (Dipsacus laciniatus): Seed Development and Persistence). Has high germination rates (28-86%) with no after-ripening requirements and remain viable in the soil for 2 years (The Effects of Fertilization and Time of Cutting on Regeneration and Seed Production of Dipsacus laciniatus (Dipsacacae)). Biennial (Cutleaf Teasel (Dipsacus laciniatus): Seed Development and Persistence; The Effects of Fertilization and Time of Cutting on Regeneration and Seed Production of Dipsacus laciniatus (Dipsacacae)). Blooming per individual lasts one day (GBIF). Teasel plants flower from April to October throughout their nonnative ranges (EOL). Flowers from July to October (Bugwoodwiki). Has no innate dispersal mechanism, but is thought to be spread along interstates by vehicles, by wind tunnels created by paved roads, and on mowing equipment. In some areas may be spread by birds and with horticultural use (The Effects of Fertilization and Time of Cutting on Regeneration and Seed Production of Dipsacus laciniatus (Dipsacacae)). Many bird species eat teasel seeds (EOL). However, the bulk of the evidence seems to indicate that gravity is the primary mechanism for natural dispersal (besides roadways), and this only occurs near the parent plant. Has no innate dispersal mechanism, but is thought to be spread along interstates by vehicles, by wind tunnels created by paved roads, and on mowing equipment. In some areas may be spread by birds and with horticultural use (The Effects of Fertilization and Time of Cutting on Regeneration and Seed Production of Dipsacus laciniatus (Dipsacacae)). Dispersal along roads and waterways has been important to teasel spread in North America. Teasel seeds are not morphologically adapted for wind dispersal. Water and human activities are the most likely methods of long-distance teasel seed dispersal. Long-distance teasel seed dispersal by water is likely. Along busy roadways and mowed areas, teasel seed may dispersal 2 to 3 times farther than the maximum passive dispersal distance of 4.9 feet (1.5 m). In a natural area near Clinton Lake, Illinois, just 1.3% of cut-leaved teasel seeds made it to the farthest seed trap, which occurred 15 feet (4.5 m) from the source population. Along a nearby interstate, 3% of cut-leaved teasel seeds dispersed 20 to 49 feet (6-15 m) from the source population. In the Mascoutin Recreation Area of DeWitt County, Illinois, the size of mowed cut-leaved teasel patches increased by 360 feet² (33 m²) and unmowed patches increased by 45 feet² (4.2 m²) after 2 years of mowing. In mowed areas, 95% of cut-leaved teasel seed dispersed within 20 feet (6 m) of the source population and more than 1% dispersed more than 30 feet (10 m) from the source (EOL). Since there is some evidence for wind and water dispersal this is marked yes. Has no innate dispersal mechanism, but is thought to be spread along interstates by vehicles, by wind tunnels created by paved roads, and on mowing equipment. In some areas may be spread by birds and with horticultural use (The Effects of Fertilization and Time of Cutting on Regeneration and Seed Production of Dipsacus laciniatus (Dipsacacae)). Highways facilitate dispersal of this species (Cutleaf Teasel (Dipsacus laciniatus): Seed Development and Persistence). Dispersal along roads and waterways has been important to teasel spread in North America. On the Lincoln National Forest in central New Mexico, all common teasel populations in habitats occupied by the threatened endemic, Sacramento Mountain thistle (Cirsium vinaceum), occurred adjacent to roads (P<0.0001). In Missouri, teasel populations have "skyrocketed" since the early 1990s. Populations have spread primarily along highways, and researchers suggest that right-of-way mowing operations have been important to seed spread. Since about 1965, cut-leaved teasel spread from New York throughout the Midwest, and much of this spread has occurred along major roadways. By about 1980, cut-leaved teasel was rapidly spreading throughout the Midwest. 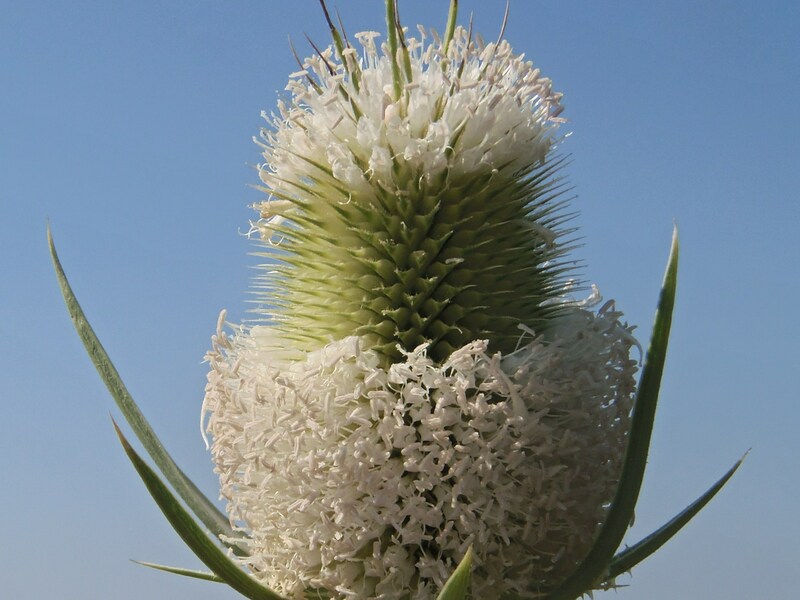 In Illinois, areas with no or few cut-leaved teasel plants supported large populations in 5 to 10 years. Cut-leaved teasel was first reported in Missouri in 1980, and by about 1990, occurred in 24 Missouri counties. Populations were most common along Interstate 70 (EOL). Teasel seeds are not morphologically adapted for wind dispersal. In a field in Kalamazoo County, Michigan, 99.9% of common teasel seeds fell within 4.9 feet (1.5 m) of the parent plant. Water and human activities are the most likely methods of long-distance teasel seed dispersal. Long-distance teasel seed dispersal by water is likely. Common teasel seeds floated in water for 22 days without losing viability. Along busy roadways and mowed areas, teasel seed may dispersal 2 to 3 times farther than the maximum passive dispersal distance of 4.9 feet (1.5 m). In a natural area near Clinton Lake, Illinois, just 1.3% of cut-leaved teasel seeds made it to the farthest seed trap, which occurred 15 feet (4.5 m) from the source population. Along a nearby interstate, 3% of cut-leaved teasel seeds dispersed 20 to 49 feet (6-15 m) from the source population. In the Mascoutin Recreation Area of DeWitt County, Illinois, the size of mowed cut-leaved teasel patches increased by 360 feet² (33 m²) and unmowed patches increased by 45 feet² (4.2 m²) after 2 years of mowing. In mowed areas, 95% of cut-leaved teasel seed dispersed within 20 feet (6 m) of the source population and more than 1% dispersed more than 30 feet (10 m) from the source (EOL). While animals and water may be infrequent mechanisms for long-distance dispersal, the bulk of the evidence seems to indicate that gravity is the primary mechanism for natural dispersal (besides roadways), and this only occurs near the parent plant. Dispersal along roadways is also not long-distance, but only up to 3 times further than natural dispersal (so 4.5 m).